The days of radiologists dictating their reports and sending them to transcriptionists are becoming a thing of the past. Today, it’s all about speech recognition. 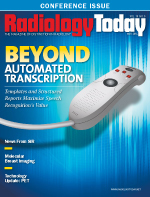 “Speech recognition for transcription has been around for quite awhile in radiology,” says Russ Cardwell, vice president of imaging solutions for M*Modal. It’s not only expected now but also employed to reduce costs and speed report turnaround times, he says. While speech recognition programs have become the new norm, the transcription process itself hasn’t changed, says Steve Retz, manager of the eHealth documentation solutions business at 3M Health Information Systems. Radiologists still record their findings and interpretations, only now the computer transcribes the dictation and sends it back to the radiologists to edit and sign, he explains. “Those fundamental steps are still there,” he says. One advance that enhances the value of speech recognition software is combining physician dictation with structured reporting templates. The templates help ensure quality because they outline “what you need to include in this report and provide shortcuts as to how to do that,” Murfitt says. He says the system doesn’t tell radiologists that the exam should be billed as a complete abdominal ultrasound, but if that’s the exam that was ordered, the system makes it clear what elements must be included for proper reimbursement. The system can help productivity because exams don’t need to be sent back to the original radiologist for additional reporting when someone notices the missing element or to a second radiologist to reread so that all the elements can be included, according to Cardwell. He says one of M*Modal’s clients associated his or her templates down to the exam code, thereby enabling the correct report template to load for every case. This enabled the customer to print on the report, “This qualifies for PQRS #146.” Later, the customer could attribute approximately $180,000 in additional reimbursement in combination from his or her work in associating that exam template and the use of M*Modal’s speech recognition products, he says. Templates typically are customized from one radiology group to the next. “We provide the application, the tool for them to create the template,” Cardwell says. “Typically, the harder part is to get the 10 radiologists in the group to agree on the text contained in the template. They can agree by practice or a single user can have it set up a certain way.” M*Modal’s speech recognition software provides flexibility “because we know that getting more than one person to agree on a template is not always easy,” he adds. The structured templates also include space for any information required not only for the particular exam to be reimbursed but also for accreditation. Starting this July, The Joint Commission that accredits hospitals and ambulatory health care organizations will require radiation dose utilized for CT exams to be recorded in all patient records. With the latest speech recognition programs and add-ons, radiation dose can be integrated directly from the imaging equipment into the radiologist’s report. Another advantage of combining speech recognition and templates is standardized records. For example, all breast exams have a dedicated BI-RADS entry, which standardizes breast imaging findings terminology and report organization along with the classification system for mammography, ultrasound, and MRI of the breast. “The templates guide the radiologist through the information that needs to be reported, making it easier for the referring clinician to find and retrieve what they need from it,” Murfitt says. Some radiology reporting software also allows radiologists to capture a portion of the image to which they are referring and include it directly in their reports. “That’s something that radiologists really struggled with in the past,” Retz says. “Now the radiologist can say to the referring physician, ‘Here’s an image of the patient’s collar bone, and you can see the fracture.’” Being able to include images also helps if the radiologist wants to share his or her findings with a colleague for a second opinion, he says. How well radiologists seamlessly integrate voice recognition workflow with other systems such as PACS is the future, says Andrew Chow-Woon, eHealth solutions manager for Agfa HealthCare. The need is for unified systems that are based on real-world workflow rather than voice recognition. It helps that voice recognition systems allow radiologists to send or import relevant information from diagnostic systems and embed it in their reports, he says. For example, with today’s voice recognition systems, radiologists can measure tumors on the screen, right click, and have the information inserted directly in their report. The measurements automatically are populated into the report, reducing the possibility of errors. “If all you have to do is right click and insert it into the report, it takes away the possibility of errors that can occur with manual entry,” Chow-Woon says. With the latest software, radiologists can import not only images but also information they’re using to interpret those images. With some programs, the radiologists can hyperlink words in their reports that allow their colleagues to research their comments, if desired. For instance, if a radiologist is looking at a chest X-ray and detects small lung nodules, and he recommends that the patient’s physician follow the Fleischner Society pulmonary nodule criteria for follow-up, he can hyperlink to the recommendations so the physician can see exactly when follow-up imaging is needed based on the nodule size and the patient’s age and risk. “This is the next big wave that has started already with image sharing,” Murfitt says. Speech recognition software also is being combined with critical findings so that if a report contains a finding that needs to be acted on immediately, it doesn’t get lost. “A couple of times a day, radiologists will come across critical findings that require urgent communications to the attending physicians,” Murfitt says. Nuance PowerScribe’s critical test results management solution triggers a cascading communication protocol, including an alert that immediately notifies the attending physicians and documents delivery and receipt. If the alert isn’t acknowledged within a time frame set by the institution, it automatically will be forwarded to administrators or someone at the next defined point of escalation, who will ensure that appropriate providers respond. M*Modal’s system has dozens of critical findings that it automatically looks for in real time. “But after you get past the first five or seven that everyone agrees to, there is great disparity,” Cardwell says. As a result, organizations can choose which critical findings to alert in real time or which to not alert, he says. The radiologist uses it not just to highlight words such as “mass” or “malignant” but the small words that accompany them and that are critical because of their significance and meaning. For example, if the radiologist is reporting “no mass,” the word “no” is highlighted along with the word “mass.” The addition of the highlights enables the radiologist to double-check the report for accuracy before sending it, Retz says. Samir Patel, MD, chairman of radiology for Elkhart General Hospital in Indiana, a 325-bed hospital that serves more than 19,000 patients per month, finds that taking full advantage of all the reporting and functionalities of its Nuance PowerScribe 360 platform has enabled his department to devote more time to patient diagnoses and management. Since the system was installed in 2012, it has helped to reduce report turnaround times from three or four hours to less than 15 minutes, he says. Also, it has eliminated more than 1,100 hours of transcription time per year, saving a considerable amount of money. Patel likes that PowerScribe 360 also improves the department’s workflow. When beginning a report, the radiologists can enter data into templates. Once done, the radiologists need only to hit the icon and review the information. “Most of the time, we have no edits and go right into dictating the findings and impression,” he says. The streamlined process reduces turnaround time. “It’s about all the things you don’t have to dictate,” he adds. By utilizing structured reporting and autoloading templates that are mapped to specific procedure codes, radiologists know exactly what they must include for their reports to be complete and to qualify for reimbursement. “With PowerScribe 360, the radiologists know they’re using the exact language the Centers for Medicare & Medicaid Services is looking for,” Patel says. The technology is available, Cardwell says, but usually it’s a matter of the amount of time and energy the group wants to leverage report templates. A customer’s exam code dictionary could include several thousand different codes. To associate them one by one to a template takes time. However, the benefits of productivity and improved report quality will pay dividends every day if they do, he says.